Mason found this, my new favorite food blog: Homesick Texan. The writer is a Texas girl who lives in New York. From the short time I’ve spent browsing her site, it looks like most of the food she writes about is Mexican and Tex-Mex. YUM. We are making this tonight to eat while we watch LSU pummel Bama. 1 large head of garlic (10 cloves or dientes as it’s said in Spanish) the cloves crushed. 1. Take the chiles and remove stems and seeds (can reserve seeds to spice up asado later). Place chiles in a large bowl, pour warm water over them and then add two crushed cloves of garlic and 1 teaspoon of salt to bowl. Let soak overnight or for eight hours. 2. After chiles have softened, throw out the soaking water (it will be bitter) and place chiles in a blender with 1/2 cup of fresh water. Puree until a thick paste is formed—it should be about four cups of puree. 3. In a saucepan, sauté on medium heat the diced onion in one tablespoon of lard, bacon grease or oil until cooked and starting to brown, about ten minutes. Add the remaining 8 cloves of crushed garlic (about 1/3 cup) and cook for one more minute. Add the chile paste, 1 cup of water, the cilantro, Mexican oregano, salt and pepper. 4. Cook chile sauce on medium heat for five minutes, stirring occasionally. Don’t be alarmed, but it will probably dramatically bubble and heave. 5. Generously salt and pepper pork cubes. Add the remaining 2 tablespoons of lard to a disco, Dutch oven or skillet (may do this in batches) and brown meat on all sides. 6. Add chile sauce to meat, and cook covered on low heat for 2 1/2 hours, stirring occasionally. 7. Serve topped with cotija or wrapped in flour tortillas. She also includes (in the asado post) instructions for making your own Mexican wok out of tractor parts, and does so with a straight face. Good stuff. Does anyone have a copy of yesterday’s (Nov. 5) Austin American Statesman they are willing to sell to me? I stupidly didn’t buy one yesterday morning and now they are nowhere to be found — I can’t even get my hands on the special reprint they did for today. I really, really want to frame the front section to show Ryan when he is bigger. UPDATE: Alyssa is sending me one of her extra NY Times!! Thanks, Alyssa! Since I was in elementary school that there won’t be a Clinton or a Bush in office. If you haven’t already, watch Obama’s speech from last night as well as McCain’s concession speech. Both are class acts. ETA: Found a way to embed them here. I’m behind posting pics because work has been insane lately and the last thing I want to do at night is jump on the computer. 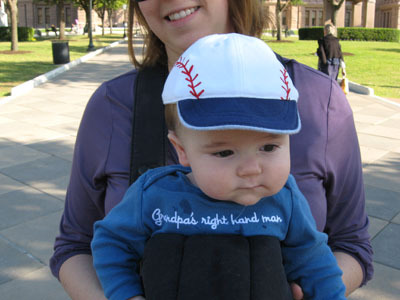 Anyway, Ryan will be 5 months old tomorrow and it’s been a pretty cool month. 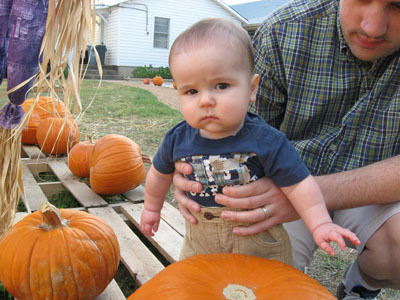 We went to a pumpkin patch last weekend and he was less than exuberant about it. It may have been because the pants I put him in are 6 month-sized and make him look like a grandpa because they go up to his chest. Or it may have been because it was close to his bedtime. Anyway, I’m still glad we went. This picture sums up the experience. Ryan was much happier about Halloween. He tolerated his costume for 1.5 hours, which is a ton of time if you know him. 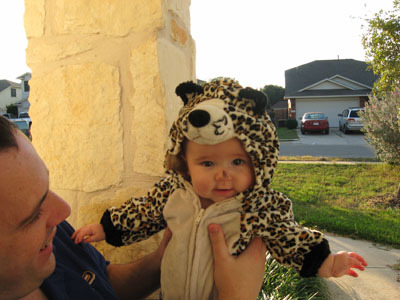 Sadly, he goes to bed around 6:30 and that’s when people start to trick or treat around here, so none of our neighbors got to see him in his cute cheetah outfit. But we did! The brown stuff on his nose was my attempt to paint his nose brown and put whiskers on him, but he doesn’t like it when you mess with his face (can’t blame him) and started to cry so I stopped. This next pic just makes me laugh so I’m sharing it here. 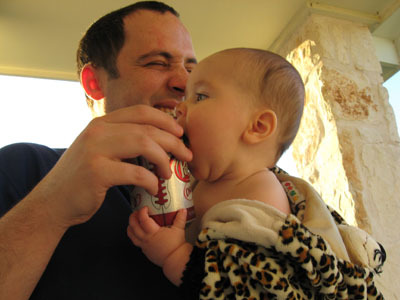 Ryan has a thing for Diet Dr. Pepper cans and just has to touch them and put them in his mouth every time he sees one. He was getting hot so we had taken the hood off when I took this pic. And finally. Today was the first day of the Texas Book Festival. We go every year, and I admit I had reservations about bringing Ryan. The author sessions are usually pretty quiet and focused, and, well, he isn’t. BUT he did absolutely fine during sessions with Christopher Buckley and H.W. Brands. I went to a session with Rick Bragg, who is one of my favorite authors, sans Ryan and he was such a good speaker. 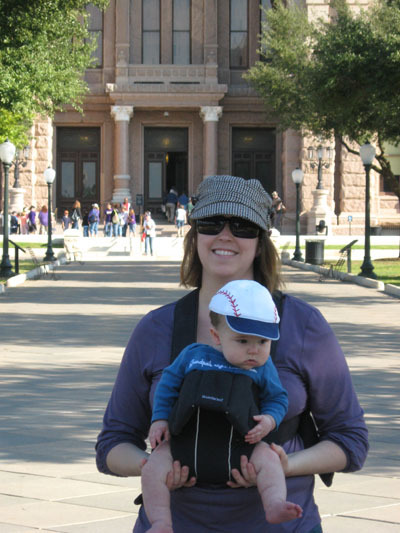 Anyway, the next two pics are of me and him in front of the Capitol, where the festival is held.